For over 25 years amateur builders and beginning yacht designers have been trained in the US to accept the notion of a trade off between sea worthiness, comfort, performance and cost. This notion is prevalent on the east coast of the United States but has been rejected by much of the rest of the world. The notion allows architects to rationalize vessels that are marketed for crossing oceans but do not pass the capsize risk ratio. An ocean race boat, to get 60 percent of the performance of a buoy racer, can get only say 25% of the seaworthiness needed for a bluewater cruiser is the argument. But what is a bluewater cruiser? The only historical reference for the term “blue water” is to a 55-foot Alden ocean racing schooner that was named Blue Water. She is just as famous as the Brilliant, a 61 footer that sails the Carabian out of Mystic even today. Both were built pre 1950. 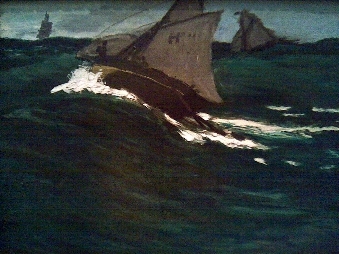 The term bluewater was not used during the age of commercial sail. It is a recent term used for marketing. The current day ETAP 26i is marketed as a “rough and ready” bluewater cruiser. She is about 1 foot longer at the water line and 1,000 lbs heavier than an X. 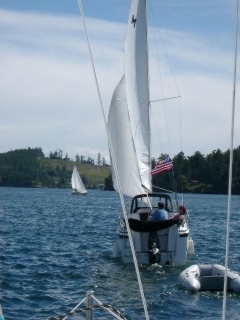 The notion of what makes a good bluewater cruising boat must be tempered with the fact that until July of 2006 no one to my knowledge had ever defined bluewater. In July of 2006, Ann Hoffner in Saling Magazine (pg 53) defined bluewater as meaning “that you are truly out of sight of land”. This definition is interesting in that it explains why more boaters on the east coast of the US consider themselves bluewater experienced. On the east coast the land is flat and owing to the curvature of the earth in as little as 4 nautical miles the east coast US sailor would be out of site of land. On the west coast the hills and mountains may be visible even after a sail to Catalina island (a common weekend trip for a Costa Messa build), which is more than 10 times that distance. Sailors should see that the term bluewater has little meaning. There is a definition for the word seaworthy and I think most feel that a blue water cruising boat is a seaworthy boat. The problem with that is that the definition of seaworthy involves crew competency. A boat that is seaworthy when she comes into port, then is crewed with lubbers (those who only know life on land), will not be seaworthy when leaving port – by definition. Likewise a boat originally intended for lake only use, when crewed by competent patient seamen, can circumnavigate the globe. 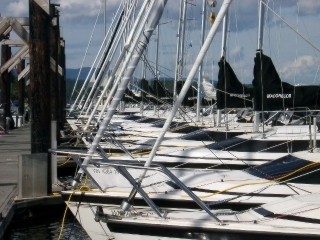 John Kretschmer, in a July 2006 Sail Magazine article, states that the perfect bluewater boat is a work in progress. This statement is suitable given that crew competency changes during the duration of a voyage and during the life of her owner. This puts the whole Category A, B, C, D thing into the realm of bad marketing. I mean if you assume that Category A means blue water, Category B means that but not self sufficient and then put lubber crew into the boat without training you have done consumer harm. The marking is a crutch that is misleading and potentially harmful is the point. What Category A really means is more expensive than Category B, and what Category C means is less expensive than Category B. There is no real meaningful connection to seaworthiness. A life raft or boat is by definition Category A. Dr. Alain Bombard, a French scientist, proved that life rafts should be designated category A in 1952 when he made a transatlantic passage to Barbados from Las Palmas in the Canary Islands. He did this 3000-mile 65 day voyage in a 15 foot Zodiac inflatable named Heretic, surviving on raw fish and small amounts of seawater. Most competent seamen would prefer to cross an ocean in a Mac26x than in a life raft. The Mac26x meets many preferences for that kind of work. Sailors such as Kretshmer want solid glass down south with extra glass at stress points and they avoid cored hulls. They require topsides that are immune from rain leaks and bonded to the hull. They seek stiff hulls with longitudinal stringers instead of just molded in liners, bulkheads and furniture pieces. They want internal rather than external fin ballast that is integral to the hull. They spend any extra money on new furling systems. Especially required is a “builder with a conscience and a philosophy.. they’ve translated into a process.” Macgregor Yachts excede these requirements. In addition a balanced hull that holds course without human intervention even upwind, an interior that works, a means of going forward safely (like through a bow hatch) and the ability to ground without damage coupled with a kind sea motion when underway and speed to avoid storms is valuable. The X and the M are worthy by all criteria. The offshore pocket cruiser potential of the Mac26x was recognized as early as 1997 by Offshore Magazine and continues to exceed expectations. In addition, features such as twin transom hung rudders and water ballast are recognized as valuable today on Ocean 50 and Volvo 70 racers. A two rudder boat will handle better and be faster in hard-reaching ocean conditions and water balast provides a better ride eliminating much of the slamming problem on fast moving sailboats. The advantages of solid flotation can not be under emphasized. The X and M have lifeboats build into them through solid flotation and water ballast tanks that could be filled with air for additional flotation. While crew can make an otherwise unsuitable TP52 race boat worthy of ocean crossing, MacGregor Yachts is the only builder/designer that I know of that points out that high costs may not be related to seaworthiness or performance or comfort but rather to inefficient production and design. Ted Brewer’s notion that comfort is determined to a large extent by size ignores the fact that most US consumers would prefer to cross the country quickly in an air conditioned sports car than more slowly in a HumVee. Larger does not mean more comfortable on the highways and it doesn’t on the water either.